Note, October 4th: interaction with objects when using Desktop Mode were introduced with the Sansar Discovery release. Read more about the release in this article. Updated, September 8th: minor changes to reflect changes made to personal teleporting when in Desktop mode in the September release. Note: this article covers using the Sansar client in Desktop mode. For information on creating a Sansar account, downloading the client, and creating and avatar, please refer to Sansar: getting started – the basics. Use the menu to switch Atlas view between displaying all publicly available experiences, those produced by Sansar Studios (Linden Lab and partners), and those you have created. Use the Create button to start creating an experience (if available), review your existing experiences or change your Sansar subscription. Use the scroll wheel to scroll down / up through the Atlas when the mouse is hovered over the atlas tiles. Click “<” or “>” to page through featured experiences. Click the display experience image to open the experience floater (see image below). Click the Visit button to visit the experience. Click the Copy URL to the currently selected experience to your computer’s clipboard. Use the “<” and “>” to page forward / backward through available experiences. Use the X button to close the floater. Click the Visit button to visit the currently displayed experience. Click the display experience image to open the experience web page. Click the creator’s name to list all experiences by the same creator & select any of them to visit it. The UI icons in Sansar’s run-time mode are relatively self-explanatory. Hovering the mouse over any of them will display additional hover text. My Looks: takes you to the Avatar App, where you can change you appearance, swap avatars, create new avatars, add attachments, etc. On exiting the Avatar App, you will be returned to the starting point of the experience you were in. Atlas: Opens the Atlas, allowing you to select and enter another experience. Closing the Atlas without making a selection returns you to the current experience. My Experiences: opens a list of the experiences you have created (if any), which you can then jump to. Options to create a new experience (if you are able to) and / or change your subscription are also available. Chat: opens the Chat window. A green circle displayed against this icon indicates awaiting direct messages / Friend requests. 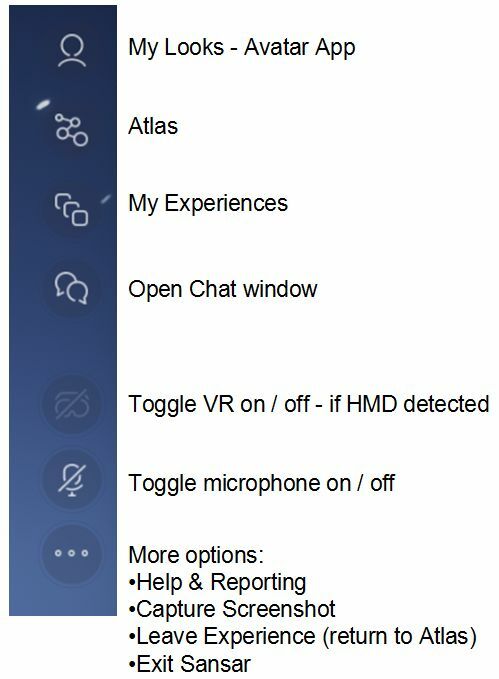 Headset icon: (only available if a HMD is detected) toggle between Desktop and VR modes (can also be done via F1). Microphone icon: (only available if a microphone is detected) toggle microphone on / off. More Icon (…): as per the notes in the image, above right. Toggle between third-person and 1st person (“Mouselook”) views. Enter camera “free flight” mode (F3 to return camera to 3rd person view). Move your avatar / camera (free flight mode) forward, left, back and right. Press and hold the right mouse button to smooth your avatar when turning left/right turning. Orbit camera around avatar when in third-person view and standing still. Pan and tilt avatar’s field of view in first-person view. turn avatar smoothly when walking (1st or 3rd person view). Pan and tilt the camera when in “free flight” mode. 3rd person view only: adjust camera position relative to avatar. Camera “free flight” mode only: increase / decrease camera vertical elevation. Camera “free flight” mode only: decrease / increase camera movement speed. 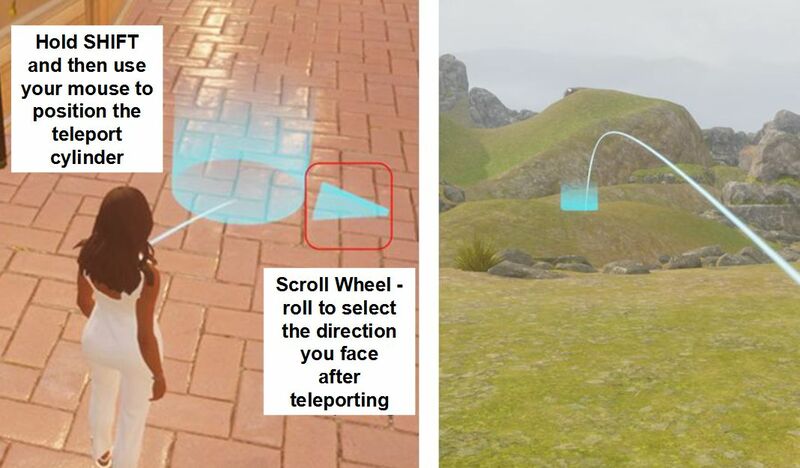 You can increase your movement around experiences using your personal teleport option, which is available in both 1st and 3rd person modes. Press and hold the SHIFT key display the blue teleport cylinder. Use the mouse to position the cylinder at the point to which you wish to teleport. Use the mouse scroll wheel to select the direction you wish to face on arrival (indicated by a blue arrow). Click the left mouse button to teleport. So, you’ve heard the new about Sansar opening. You’ve signed up for an account and have your new avatar. Now what? The Atlas has many, many places to visit. Some are more interesting than others. I’ve been hopping around for a while now, and so I thought I’d offer a handful of suggestions and one or two tips which may be useful for you. Once again, as I’m a non-VR headset user, the Sansar experiences selected here have been chosen on the basis they work without having to use a HMD as well as providing a means to gain familiarity with using keyboard controls. Tip: The URLs in this article lead directly to the experiences described. You can obtain them directly from the Atlas by clicking on the image of an experience. This will open a separate window. This includes a Copy URL button – which does exactly what it says. There are also two page buttons (< and >), allowing you to page through experiences in the Atlas individually. If you want to see all the experiences by a single creator, click on the creator name in the Atlas or Atlas window. Pasting a URL into a web browser will display its Atlas web page. Clicking on the Visit button on the web page will launch the Sansar client and take you to the experience (if the client is already running, you’ll be asked if you want to visit the selected experience). Now open to the public, the Apollo Museum is bound to attract me as I love all things space exploration. However, there is another reason for recommending it: it is a good example of some of the interactions that can currently be achieved in Sansar and a demonstration of one method of teleporting. This is one of the more “high-end” experiences, and can take time to load; however the wait is worth it. This is a rich content experience, mixing 3D models, audio, video and information boards to take people on a journey through the major Apollo lunar missions. Centred on the Apollo 11 mission, the experience includes information on the other lunar mission in the programme, models of the Saturn V, Command and Service Module and Lunar Excursion Module and a scaled model depicting Apollo 11’s trip from the Earth to the Moon. Interactive elements are provided through proximity / standing. For example, spread along the floor of the museum. step on these to hear audio extracts from the Apollo 11 mission. Similarly, audio on the various Apollo missions from 11 onwards can be heard. Also on the floor close to the upper end of the Apollo Saturn V rocket is another disk. Step on it and it will teleport you to a recreation of Tranquillity Base and the Apollo 11 Lunar Excursion Module Eagle with floating informational text and a sound scape of recordings from the mission. Throughout, the experience is very well done, with the lighting on the Surface of the Moon particularly well done – as is the Earth (to scale as seen from the lunar surface) hanging in space at the same position it would have been seen by Armstrong and Aldrin. There are one or two problems with the build – sounds can overlap, and it is clearly intended for HMD use; but it makes for a useful introduction to Sansar (and an informative visit!). Tip: If you’re not using a HMD and are finding movement difficult in third-person view due to the camera, try using WASD or the arrow keys, together with pressing and holding the right mouse key and sliding your mouse left or right to turn. Combining these allow for a relatively easy means of moving in either 3rd or 1st person view. 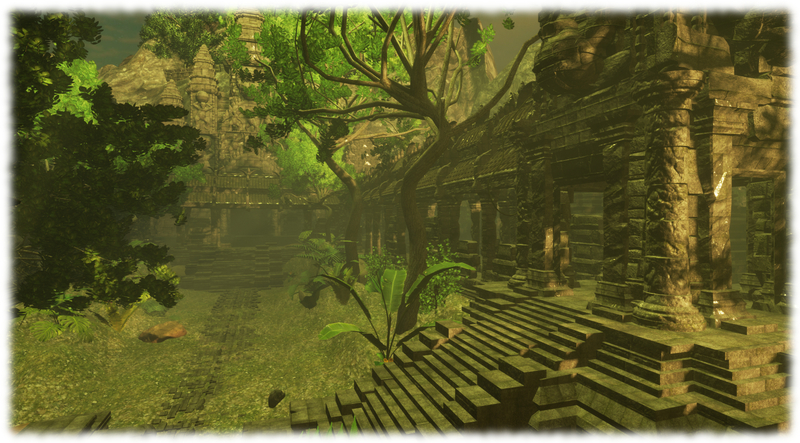 As featured in the Sansar preview #5 video, Unit 9’s Monkey Temple is a good example of an experience using ambient sounds and Sansar’s environmentals to produce a jungle-style setting with a unique temple in three distinct areas, and which includes interactive games. These are best played if you have a HMD and controllers, however, it is possible to “kick” a “ball” around by walking into it. Tip: try free-flying your camera around the temple. Press F4 to release the camera and use WASD or the arrow keys to move forwards / backwards or slide left / right. E will move the camera up and C will move it down. You can also use the right mouse button technique mentioned above to pan the camera. The numeric pad “-” (minus) and “+” (plus) buttons can be used to slow / increase the camera’s movement speed when in free flight. Press F3 to anchor the camera back with your avatar once more (note that pressing F3 twice will drop you into first-person look). Note: This article covers setting-up an account, downloading the client, selecting and customising your avatar and getting familiar with the user interface. For detailed information on working with Snsar in Desktop Mode, please refer to Sansar basics: Atlas, Desktop mode movement, chat and friends. 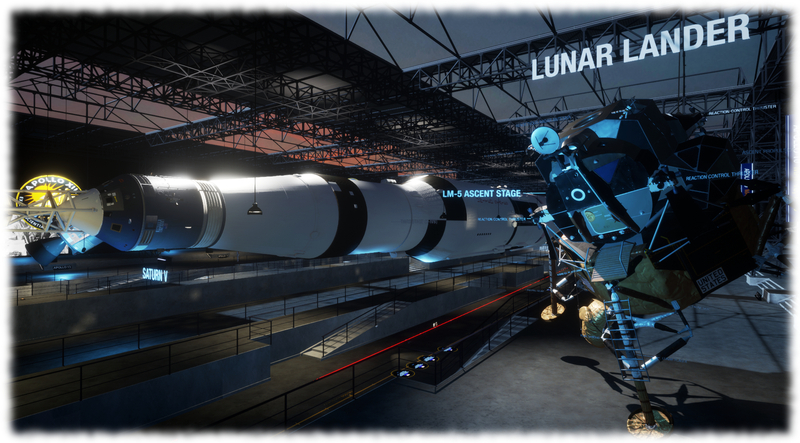 On Monday, July 31st, Linden Lab opened the Public Creator Beta for Sansar – which you can read about here. The following is designed to offer those from Second Life joining Sansar with some guidelines on getting started. These can all be found as a part of Sansar’s comprehensive Help pages. 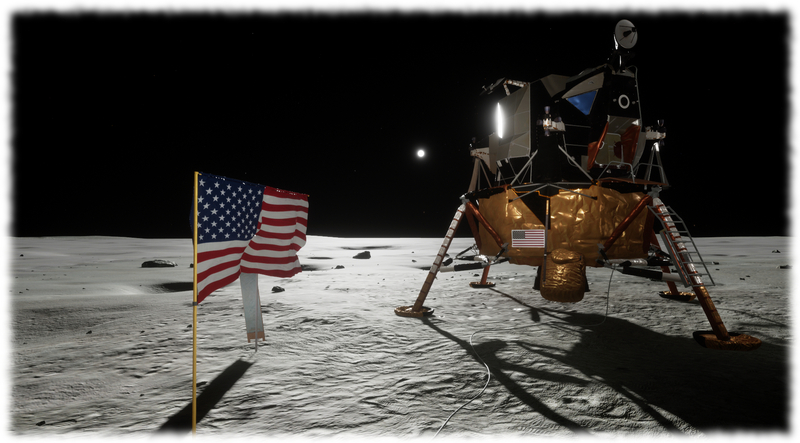 You can also keep up-to-date with announcements via the Sansar blog. For ease of reference, and given I don’t have continuous access to a VR headset, these notes are biased to using Sansar via the keyboard and mouse, including working in-world with the UI. These note were written at the time the Sansar Public Beta was launched. As Sansar is evolving, they may at some point become inaccurate or superseded. When you have submitted the account creation form, you’ll receive an e-mail asking you to verify the address. Clicking on the verification link will both verify you e-mail address and take you to the web log-in page. Log in to the latter using the e-mail and password you have created. The Sansar Atlas is displayed on your screen. This is the point at which you can join any available Sansar experience from the wb, once you have installed the Sansar Updater (client). Experiences will eventually be accessible via their own web pages. You do not have to use the web version of the Atlas with Sansar – you can access the Atlas from within the client. The first step towards accessing Sansar is to download and install the (currently 64-bit Windows only) client, via the Download link at the top of the Sansar web site. Simply follow the on-screen instructions from the installer (which may also update itself as the first part of the install process), or follow the installation instructions. Installation is fairly quick and simple (neither my i4 / GTX 970 main system nor the 2012 i3 / Intel graphics laptop I also use had any issues in installing the client). Once the client has installed, launch it. This may trigger an automatic update to the client itself, which can take some time. 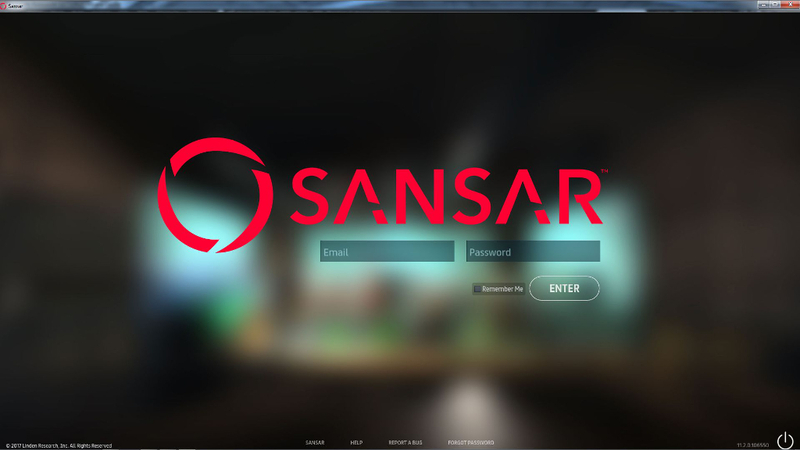 Once any update has completed, the Sansar log-in screen is displayed. Log-in using the e-mail and password you used when creating your account. Note: Sansar allows you to have multiple avatars, which are created via the Avatar App. This is launched automatically the first time you log-in to Sansar via the client, and can be launched at any time using the My Looks buttons. The first step is to supply an avatar name and avatar ID (a unique and permanent ID which serves as a unique identifier for each user). The latter can be the same as the avatar itself, or set to something else – letters, numbers and hyphens only. 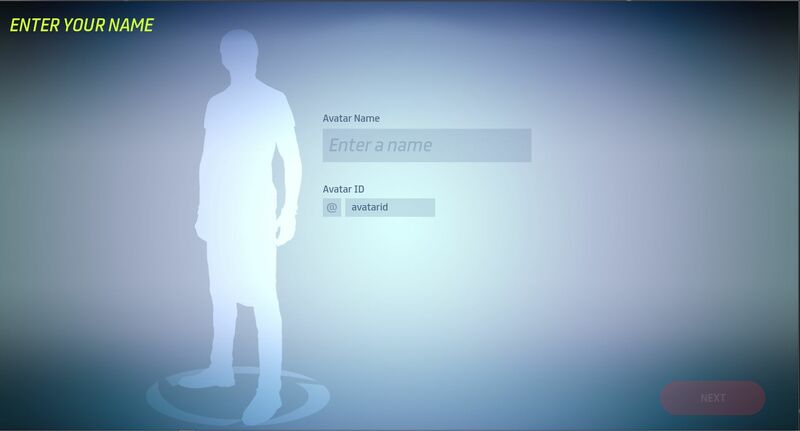 Note that the avatar ID cannot be changed once set, and at this time, the avatar name also cannot be changed, so make sure you’re satisfied with the latter before continuing – it’s how everyone in Sansar will know you with this avatar. Clicking Next from the Name screen will take you to the avatar picker – and SL users should recognise the origins of this! Use your mouse to scroll left or right, moving the Sansar logo under the avatars to indicate the currently selected one. There are two buttons on this screen: Customise and Next. 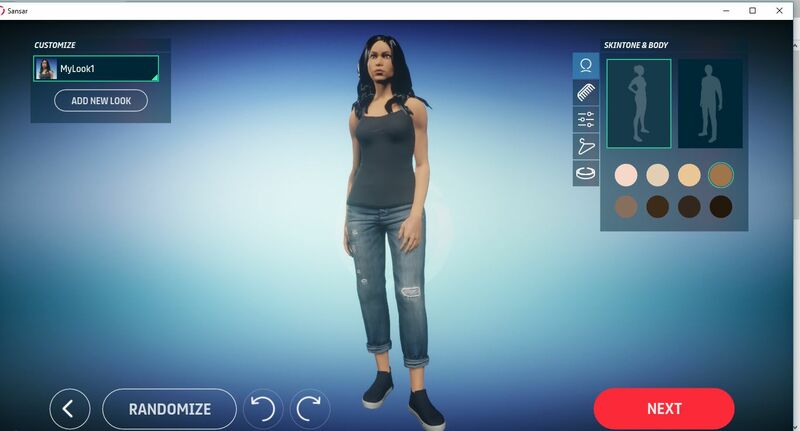 Customise takes you to the current avatar customisation options which allow you to set gender and skin tone, hairstyle, change the facial features though sliders, select an outfit and accessories. Note that avatar customisation is not as advanced as Second Life at this point in time. You can save multiple looks for the same avatar via the Customise panel in the top left of the customisation screen. You can use the buttons at the bottom of the screen to go back to the avatar picker, select an entirely random look for the avatar from the available set of avatars, or undo / redo changes. Next from either the avatar picker or the customisation screen will update the avatar selection a your avatar and move you to the Sansar Atlas. Reminder: You can return to the Avatar App at any time from the My Looks option (top right of the Sansar Atlas display) or from within an experience via the My Looks button (see below).